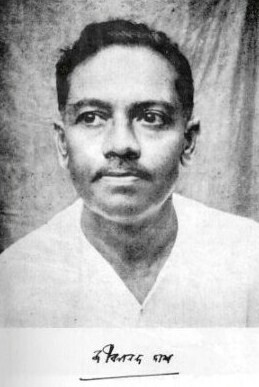 Jibanananda Das (1899-1954), according to most critics, scholars and lovers of Bengali poetry, is the greatest Bengali poet after Rabindranath Tagore and by all means, the truest modernist vanguard of Indian poetry. Listless in his lifestyle, unimpressive in his ways, constantly plagued by the mainstream literary community and further distressed by marital feud, Jibanananda Das lived a life of pessimism, misfortune, neglect and gloom especially after he moved to Calcutta from Barishal where he was born and brought up. Rather abjectly he might have belonged with the group of avant-garde poets (led by the younger Buddhadeva Bose)who could be called the post-Tagore modernists (or adhunik) —a Bengali modernism which reflected a shift away from Tagore’s idealism toward more urban, social and political themes, it brought more stones hurled than extolment until later, posthumously. Growing up within the heart of the green Bengal plains, Jibanananda had been deeply affected by its flora, fauna , natural history and phenomena - all of which took up an important place in his poetry. His book rUpasee baanglaa (Bengal, the beautiful) is a landmark in Indian Nature Poetry and remains until today one of the best loved poetry books in Bengal. A Master of Arts in English Literature from Calcutta University, Jibanananda Das taught in a city college during his Calcutta years. He published six volumes of poetry between 1926 and 1954. Tagore had had a glimpse of his early work and in an earnest letter to the poet had described it reticently and with some degree of insouciance as "imagist". Commenting on his own work, Jibanananda once wrote, "My work has been described as difficult, solitary, withdrawn. I have been labeled variously : as a nature poet, a socially and historically conscious one, even as an unconscious artist. I have been called a Symbolist, Surrealist and WhatNot! These are all partially correct, I suppose, but they do not capture the entire fabric." In October of 1954, Jibanananda was accidentally run over by a streetcar on Rashbehari Avenue, very close to where he lived. He succumbed to the severe injuries three days later. The Indian Sahitya Academy [Academy of Literature] posthumously presented him with the highest literary honor for his shreshhTha kabitaa (Selected Poems). To me she gave a moment's peace -- Banalata Sen from Natore. And raised her bird's nest-like eyes -- Banalata Sen from Natore. Into grazing in a dreadful dynamo of a world. Touching the Neolithic still moonlight of these horses. Will float forever; in blue red silvery silence. In my heart wake outlines of some gray city palace. and coral from waters round Bahrain. Room through anteroom to further inner room. Sky, the soft blue of grasshopper's belly. Guava and custard apple trees all around, green as parrot feathers. Just so, in the sky shines a single star. Still burning, contorting dry aswattha leaves. But has become like wan desires of a sickly salik bird's heart. In starless, mahogany darkness, avoids the cheetah's grasp. He had been waiting for this dawn. Ripping, munching fragrant grass, green as green grapefruit. Dazzle doe after doe with beauty, boldness, desire. The river's water red like macaka flower petals. Again the fire crackled-red venison served warm. Several human heads, hair neatly parted. Guns here and there. Icy, calm, guiltless sleep. Here on the edge of the forest I pitched camp. I listen to the call of a doe in heat. To whom is she calling? Like the taste of moonlight. A doe in heat calls all night long. All stags hear her sounds. Their time for love arrives. To quench their thirst-to smell-to savor! As if this night's forest were free of tigers! Not even the shadow of uncertainty. at the beauty of that doe's face. Leaving behind all water's sounds in search of another assurance. As man draws near his salty woman, lured by scent, so come those deer. The sound of their many hooves. In moonlight calls that doe in heat. Again I hear the sounding guns. The doe in heat calls once more in the light of the moon. And hear that doe's call. In the morning, by daylight, she can be seen. Nearby lie her dead lovers. Men have taught her all this. I shall smell venison upon my dinner dish. .. . Has not the eating of flesh ceased? ... But why should it? Am I not like them? Like that doe in heat? Had not it yearned to possess you? You too had learned from someone! And we lie here, our flesh like that of dead animals. I hear the report of a double-barreled gun. That doe in heat calls on. As I lie here, alone. Yet one must silently forget the thunder of those guns. Night speaks of other things upon camp beds. They too are like you. Their hearts too wither there in sleeping bags. In all the lives of us all. Not a dream, but some sensation is at work. Inside my heart a sensation is born. And all else pales to insignificance-futile so it seems. Who can go on like the simple folk? of life again, like everyman? And sows seeds like everyman anymore? Who would any longer remain awake upon his earth? It too comes to a halt. Is there just an optical illusion? Are there only obstacles in my path? Have I not drawn water in a pail? Have I not often gone with sickle to the fields? I have looked upon woman with love. I have looked upon woman with apathy. I have looked upon woman with hate. Yet it was actually practiced one day-this love. Blocked my path of love over and over again. Still, this love-this dust and mud. Why does it mumble to itself alone like churning waters? What does it gain, immense — profound? Last night was thick with wind, a time of countless stars. All night long, a vast wind played within my mosquito net. At times that net swelled like a monsoon sea's belly. It would try to fly to the stars. hip of the star Swati! Last night was such a marvelous night. there wasn't the least little space in the sky. I saw the gray faces of all the world's beloved dead in those stars. upon the shoulders of Babylon's queen. Last night was such an amazing night. To trample death under foot? To proclaim full victory for life? To excite the sullen, frightful stupor of love? As though torn by last night's compelling blue tyranny. The earth, like some insect, was swept away last night. Like so very many zebras of a verdant land, startled by the lion's roar. With life's untamable blue intoxication! away like some mischievous vulture. The smell of an ancient owl, now lost again in the darkness! Kankabati of the earth floats there and attains a body of pale incense. That attained silent peace, as though by some magician's need. As the sun faded? Haven't we seen the crow fly off into fields of fog! nights - there is no counting them. and so much grain fell! You have aged like this old woman Earth! With these words I returned home. The stars raced through the sky. Still, twenty-five years have not ended. Are shattered birds' eggs, cold and stiff. The torn spider-web, the withered spider. When did twenty-five years pass by! In midnight or morning sky. The stars have burned in the sky. You know - does this world know it, too? to bamboo leaves, dead grass, stars in the sky. The moon pours a fountain of ice! is awake alone in the November night. an October or November midnight. was awake in the November night. the bamboo leaves, dead grass, stars in the sky. The moon poured a fountain of ice! -I wonder what time it is! Then vanish into the sky-where did they go? The smell of their wings floats everywhere. Whose anchorage-hour has come on this sea-shore? As man unknowingly meets his death. It was time for their first egg. My eyes want no sleep. In the sky birds speak to one another. In our voice, the north of wind’s song! The does tear it with their teeth! I drink glass after glass. I descend from the sweet darkness of her body. Of all fatigue and bloodshed. The thoughtful girl came and called it that. I still look for that girl. When she descended the endless water-stairs? Could become instead the River Dhanshiri. Light of some other evening collects in the eyes of the old. Like the zigzag sky of the bats. Old age, tell me when you will come. Cry no more as you circle Dhanshiri’s banks! Your weeping evokes her sad eyes, eyes like the fruit of the reed. Why call her back? Who enjoys searching the heart and reviving sorrow? Cry no more as you circle the banks of the Dhanshiri! If I meet her again twenty years from now! Flows softened through reeds, kash-grass into the fields! Is scattered – night, winter, dew at Mania’s house. If suddenly I meet you again on a country road! Then after twenty years I think of you no more! If we suddenly meet again on a country road! Where does it hide itself? Twenty years from now, if suddenly I meet you in that mist! This world seems an illusory riverbank land. Like this darkness of light, love and solitude. Sincere thanks go to Arpan Banerjee, Runa Bandopadhyay, Mesba Alam Arghya and Dolonchampa Chakraborty for assisting with compilation, content and text-processing. jharaa paalak (Fallen Feathers), 1927.
dhushar paanDulipi (Grey Manuscript), 1936.
saataTi taaraar timir, (Darkness of Seven Stars), 1948.
shreshhTha kabitaa, (Best Poems),1954 : Navana, Calcutta. rupasee baanglaa (Bengal, the Beautiful), written in 1934, published posthumously in 1957.
belaa abelaa kaalabelaa (Times, Odd Times, End Times), 1961, published posthumously. sudarshanaa(Lovely Maiden), published posthumously in 1973: Sahitya Sadan, Calcutta. aalo prithibee (The World of Light), published posthumously in 1981 :Granthalaya Private Ltd., Calcutta. manabihangam (Soul Bird), published posthumously in 1979 : Bengal Publishers Private Ltd. Calcutta. aprkaashita ekaanna (Fifty-one unpublished poems), Posthumous in 1999, Mawla Brothers, Dhaka. Bose, Buddhadev. An Acre of Green Grass. Calcutta: Papyrus, 1948. Lago, Mary M. & Gupta, Tarun. Nine Poems by Jibanananda Das. trans. Beloit Poetry Journal. Vol 16, No. 1, Fall 1965. Seely, Clinton, A Poet Apart : A literary biography of the Bengali Poet Jibanananda Das, University of Delaware Press, Newark. 1990.